I thought I would put out a posting around my experiences of the VCAP5-DCD exam I sat yesterday and what I felt helped me in my preparations and what I plan to use to better my knowledge for my resitting. Yep I am going to need to re-sit the exam as unfortunately I just failed the exam but I do feel that what I studied was extremely helpful as without having done it I wouldn’t have been close so that is very positive and now i have a great idea of what I need to do in preparation before my retry. The VMware vSphere: Design Workshop [V5.0] was extremely beneficial and really gives you a great idea of what doing designs for a living is like but also how there are many different options for each solution. Unfortunately for the VCAP5-DCD exam there is only one way of doing something and that is the VMware recommended way and this is my first BIG piece of advice before doing the exam. 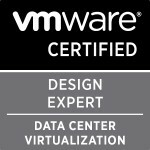 Make sure you learn the VMware way of doing design as in the exam the way you think it should be done or have done it in the past may not be the VMware recommended way of doing it and it is therefore incorrect. Also the course is only three days so I would HIGHLY recommend trying to do all the lab work from the course at home and then make sure you go to your transcript under VMware learning, click next steps under the course name and then download the completed design scenarios that you followed during the course so you can learn how VMware would have built it. The vSphere 5 Clustering Tech Deepdive book by Frank Denneman and Duncan Epping was amazing in giving me a deep understanding of the vSphere 5 cluster, it’s components and technologies and the advanced settings you can create and use for certain scenarios. This book is an absolute must for the exam and covers parts I haven’t seen mentioned anywhere else. My recommendation on this book is read and understand and be able to apply EVERYTHING in this book prior to your exam. As I mentioned I did my VCAP5-DCA prior to attempting this exam and therefore I used resources for that exam like the VMware vSphere 5 Training trainsignal videos by Elias Khnaser and David Davis and all the VMware vSphere 4 VCAP Training Package videos David did for the VCAP4-DCA exam. These helped me build a solid understanding prior to the DCD exam as I believe how can you design something if you don’t know how it works and how each part integrates. The DRBC Design – Disaster Recovery and Business Continuity Fundamentals course was another online course I did in my prep to fully understand DR and BC concepts but also how certain decisions impact how things are done. The course is free so I would highly recommend it. The above resources were really great and all the notes I created from all of them will be used extensively again to try get everything into my mind. Harley Stagner and Sean Crookston’s VMware press book Managing and Optimizing VMware vSphere Deployments is another book I am planning to read prior to my re-take as they have covered how to take your existing knowledge of all the components and apply it to a design as well as having done a mock design which I’m hoping I will learn loads from. As I mentioned above I attended the design workshop VMware course and so I am planning on going through all the course notes and the lab work and actually trying to create every portion as I don’t think there was near enough time in the workshop to be able to complete all the lab work. Also as I highlighted in red I was fortunate to notice (no one tells you these are available if you did the course) that the completed designs from the lab work have been done for you by VMware and therefore you can use these to see how VMware recommend doing them and thereby hopefully I will learn the VMware way of designing every portion. Talking of the Visio like questions, I am planning on trying to create my own mock questions while using these kinds of ideas so that i know how to create all portions super fast as the time frames in the exam are very tight. Categories: Certifications, vBrownbag, VCAP, VCDX, Virtualisation | Tags: Certifications, design, VCAP, VCAP-DCD, VCAP5, VCAP5-DCD, VMware, VMware Certified Advanced Professional Datacentre Design | Permalink. Hey Gregg – sorry to hear you didn’t make it this time, but thank you for sharing your experience, it’s hugely valuable to those of us a little bit behind you in the exam track! Great wrap-up Gregg, I’m glad to see that you are taking the positive from the situation and moving forward; well done. There is one resource I recently found, from the DCD4, but still good, is Will Huber’s DCD notes from when he prepped for the exam. It’s 46 pages and I think it’s worth a read. Good luck on the next go-round. I suggest i´m familiar with vmware design, concepts, methodolody and so forth. I work with VMware products over years and did sucessfull design implementation for some companies as well. I use all recommended learning ressources, as well yours (https://thesaffageek.co.uk/vsphere-5-study-resources/vcap5-dca-dcd/) which was very helpful, thanks for this nice wrap up! The exam is ok in the way VMware created it, with some exeptions. I miss some more important design questions, like they´re querying for. Storage is crucial for vmware enviroments, but they don´t really care in the exam. Design is a complex and detailed process, they paste in some cases the whole screen full of informations which cause the attendee rushing though, instead of being thorough. What i really like are clear written questions rather than those ones, which should confuse the student. The “Visio” styles needs getting used, but is ok for the purpose. Did you already did your 2nd attempt ? Sorry to hear you have failed it twice! How do you know you got over 270 points with one hour left out of interest? I agree the new book is really good as is the newish book by Harley Stagner. I had a short look at the remaining time for the exam until i hit the next button on last question. From that i know the huge amount of spare time i obviously didn´t use. Thanks for your nice blog here and the valuable hint you give us.